Prior to the “long pull” her guns were removed at Portsmouth and one of her wheels was removed and presented to King Haakon of Norway who was to present it to the people of Narvik in memory of the role played by Warspite in leading the attach on Narvik Fjord on 13 April 1940. On 19 April it was widely reported across the British press that Warspite had left Portsmouth en route for the Clyde. On 22 April the Nottingham Evening Post reported that she had lost one of her tows in heavy sea 15 miles off Land's End but there was no immediate danger and they hoped to “reconnect soon”. 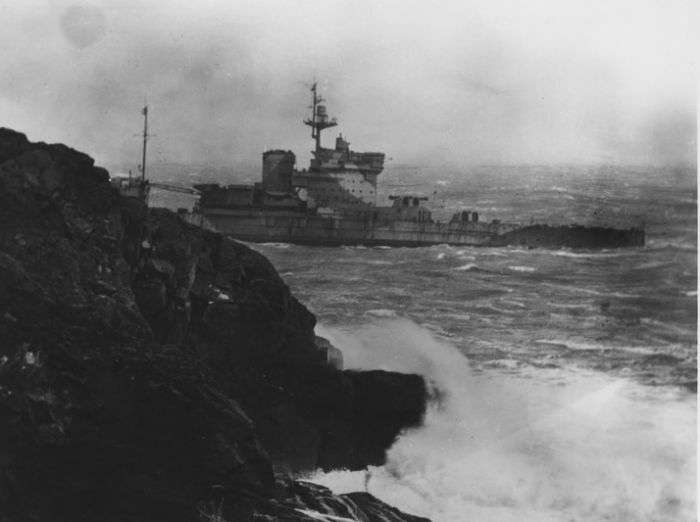 The decision was taken to shelter from the storm in Mounts Bay but the next day, 23 April, the news of Warspite's grounding off Cudden Point was widely reported. The high seas lifted her off the ledge on which she had initially grounded and pushed further inshore lodging her fast among the rocks off Prussia Cove, with her bows under water. On 24 April the Western Daily Press reported Edwin Madron, Coxswain of the Penlee lifeboat, as saying, “I feel sure she is now a total wreck”. Coxswain Madron was in a position to know, his lifeboat had just rescued the skeleton crew of the Warspite. The following account of the rescue comes from the Yorkshire Post and Leeds Intelligencer of 24 April 1947, “With 25 foot waves beating over the hulk, the crew's peril was grave, and the Mousehole (Penlee) lifeboat at once set out again to accomplish one of the finest rescues this coast has seen. Cheered by the peope looking down from the 200 feet cliffs, the coxswain, Edwin Madron, daringly brought the life-boat alongside the warspite, got two lines aboard her, and by skillful use of his engines kept in position while the eight men of the skeleton crew leaped across, one by one. It was a test of seamanship and a test of nerves, for the men had to time their jumps to a second as the life-boat rose level with the warship's decks on the 25 foot breaking seas. Coxswain Madron was right, Warspite was a total wreck and, after a number of abortive attempts to refloat her, Metal Industries recognised that it was now impossible to take Warspite to Faslane for scrapping, she would have to be broken up where she lay. In 1950 she was eventually moved to the beach adjacent to St Michael's Mount and there, over the next five years and in full public view, she was taken apart. In 1992 a commemorative stone to Warspite and all who served aboard her was erected in Marazion. Edwin Madron was honoured with the RNLI Silver Medal and mechanic Jonny Drew was awarded the RNLI bronze medal for their parts in saving the crew of the Warspite. 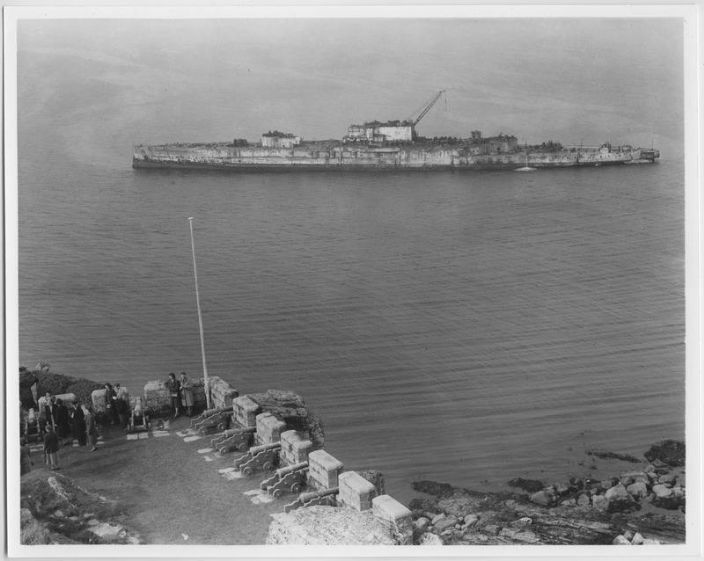 Warspite aground can be found at: “Warspite H.M.S,” Morrab Library Photographic Archive, accessed April 10, 2017, http://photoarchive.morrablibrary.org.uk/items/show/14443. “Warspite H.M.S,” Morrab Library Photographic Archive, accessed April 10, 2017, http://photoarchive.morrablibrary.org.uk/items/show/14445.